Fremantle Council last night agreed to replace two declining fig trees in Fremantle’s Kings Square with mature trees. The decision followed an extensive public consultation process in which the community supported removing and replacing the ailing trees rather than trying to manage the ever increasing risks associated with keeping them. 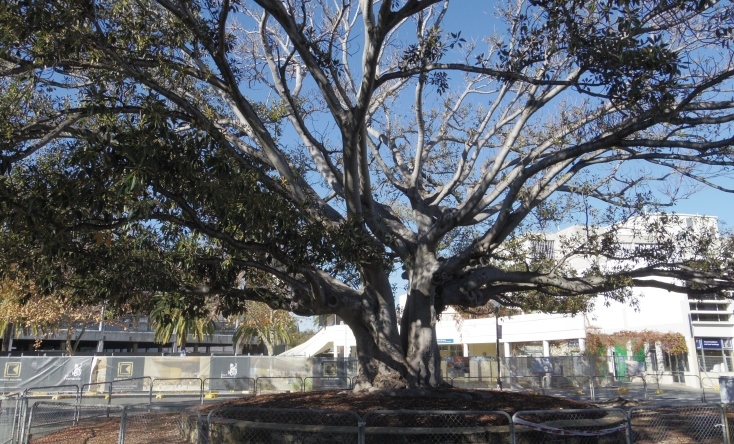 The two Moreton Bay Fig trees have been declining for over a decade but in recent years, and despite the best efforts of the City following the advice of several experts, have deteriorated to the point they now pose a risk to public safety. The most recent independent report by consulting arborists C&R Ryder Consulting (April 2018) recommended removal and replacement of the trees. Given the age and significance of the trees, the City sought community feedback on their future via a 30 day consultation period which finished earlier this month. The City received 101 formal responses with 73% of respondents supporting the replacement of the larger of the two figs, known as the Christmas Fig and 69% supporting the replacement of the second fig, known as Tree 5. Fremantle Mayor Brad Pettitt said council considered a range of factors, including the community’s feedback, in making the decision. “The expert technical advice was that both trees are in a state of irreversible decline, but given their place in the community’s heart and Freo’s history we wanted to consult with our community before making a final decision on their future,” Mayor Pettitt said. “In the end council came to the unanimous conclusion that replacing the two trees now is in the best long-term interests of Freo and based on the public feedback we received, our community does too. “Our focus will now shift to sourcing suitable replacement trees – a mature London Plane tree to replace the fig to the south of St John’s Church and a mature Moreton Bay Fig to replace the tree we all know as the ‘Christmas Fig’. Preparations will now begin to remove the two trees with City officers also beginning their search for suitable mature replacement trees, which will require a period of time to prepare for relocation. Due to their advancing age and visible signs of decline, the City of Fremantle has been monitoring the health of fig trees in Kings Square and other parts of Fremantle since 2008. In early 2017 the City engaged a bioscientist to monitor the health of the ‘Christmas Fig’ tree, which is one of the oldest trees in Fremantle, estimated to be more than 120 years old. In July 2017 the tree was given an injection of a naturally occurring enzyme and following this the City lifted the pavers around the tree, topped up the surrounding area with soil and mulch and increased the irrigation in an attempt to rejuvenate the tree. In June 2018, the City removed two other Moreton Bay figs in Kings Square after being identified by independent consultants as requiring removal due to poor health. This removal was factored into the Kings Square Public Realm Design which was put out for community consultation and approved by council earlier this year. Three other Moreton Bay figs at the northern end of Kings Square have been assessed as being healthy and are not being considered for removal. The City understands the importance of trees in its main city square when it adopted the Kings Square Public Realm Design in February 2018. The plan seeks to retain as many existing trees as possible, relocate mature trees when practical and add more trees into Kings Square. The end result is a net increase of 23 trees when the project is finished. To date this year, six London Plane trees and a Canary Island palm have been relocated within Kings Square, following 12 months of preparation and planning.